Dora Gorman who has excelled on and off the sports field will be feted at the parade in a vintage car. team for a number of years and has won county titles with Salthill/Knocknacarra. She started her soccer career in Salthill Devon under Kieran O'Mahony and she captained the Republic of Ireland under 17 Womens Soccer team at the European Championships (defeated only after a penalty shootout in the final ). 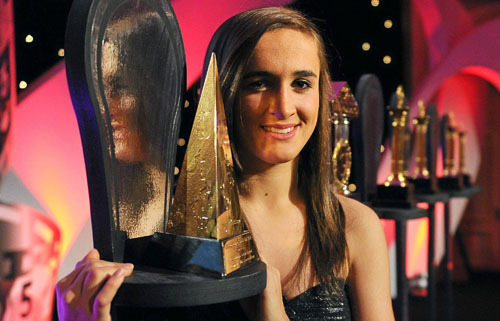 She also is captain of U19 Irish Senior Womens soccer team which played in the Algarve Cup recently. these achievements were undertaken during her Leaving Cert year. achieving first in Ireland in Leaving Cert physics 2011 as a pupil of Dominican College, Taylor’s Hill. She has also represented Ireland internationally at hockey and again to no great surprise has done so with great honour. She is now studying medicine and continues to play soccer with Peamount in Dublin.